I came across a great article from the New Yorker with an interesting title. In fact, my interest lasted all the way to the end. Spooked: What do we learn about science from a controversy in physics? If you get the feeling that science is not as pure of thought and logic as it pretends to be, then you will find some comfort in Adam Gopnik’s approachable review of the deeply hidden controversy surrounding what Albert Einstein called “spooky action at a distance.” Spooky action is the weirdest of all science, and makes telepathy and clairvoyance seem almost banal by comparison. To be honest, I did leave out Gopnik’s entertaining reference to Bugs Bunny and Yosemite Sam. Again, if you have ever been suspicious of the purity of science, the New Yorker article is well worth the read. Unlike the concerns of Einstein, Neils Bohr and the rest of the cast of early 20th century physicists, the anxiety of Jason Parker, the fictional hero, is not cosmological; it’s personal. It’s every bit as personal as it is for each of us when we sometimes question our sanity. Yes, real life can be like that sometimes, when things intrude into our ordered lives, as quickly as a Midwest tornado, but with less fanfare and warning. But every bit as destructive. And it is at those points, those juxtapositions with things radical, unexpected, that we end up questioning our grip on reality. After all, what could be more unexpected and unreal seeming than the notion that cosmological matter we can’t see, dark matter, could send comets crashing into the Earth, as Gopnik mentioned, and the Harvard theoretical physicist Lisa Randall wrote about in her book Dark Matter and the Dinosaurs. So, Jason Parker had every reason to be wary of things that move quickly and darkly. They can be a killer. Sometimes, as in the case of Parker, those internal reflections do end up having a cosmological consequence. But even if they don’t, it’s a good idea to occasionally reexamine our lives for the things which may seem one day to be magical, and the next day to be very real. In short, the magic should not be dismissed out of hand, because, after all, just like “spooky action at a distance” and “dark matter”, it may not be magic after all. How to Create a Motorcycle Salesman in Five Easy Minutes? I used to own a Honda 350 motorcycle and drove it about 35,000 miles before I sold it. But that was long ago. But still, there was a history. Such a good history, in fact, that of late I’ve been admiring a fellow’s 175 cc Honda of the same style and vintage as mine. But I’m not at all in the market for a motorcycle — not in the least. And I still wonder that. The ancients used to think that characters in dreams were embodiments of spirits or actual characters from life, and through dreams we communicate with them. And on the surface, that would seem to fit the data from this dream. But being a modern, educated man I don’t at all believe that. Still, why the confusion within a dream? Could it be that life itself is so confusing that we simply expect it to be that way, and therefore inject confusion into the characters we create in our dreams? I suppose a dream without confusion would not be a dream. As a writer of sorts I am tempted to think that in dreaming I’m creating something—an experience. And as I wake and lay down words, I am truly creating. But as a rule my characters and I always understand each other. I know their needs, desires, and weaknesses. They don’t surprise me — because after all, I created them. So maybe that is what I should heed from this dream. Perhaps our best creations should surprise us. Perhaps, when we allow ourselves to loosen control of our characters just a bit, they are free to do the unexpected. Sounds nice, like something a creative writing instructor would say, but predictably, the letting go is the hard part for a technical writer, one who writes as a career scientist, with precision and concision. You can not let go: You have to throttle your writing to best explain sometimes difficult ideas in as simple a way as you can. Your characters are equations: they have no freedom, they are defined, immutable. Nothing is left to providence. Even chance must be carefully defined, with probability ranges that are known, and in conventional terms agreed upon by the scientific audience at large. Writing like that is a conversation I suppose, between the writer and the audience, but it is never surprising, not if it is to be believable. Creative thinking, on the other hand, like dreaming, can be surprising. It can lead you were you least expect it. For instance, I thought this little blog post would be about dreaming, but it turned itself into a post about writing. Funny how the mind works some times. And now that I’ve expanded my mind a bit, I think the dream was right. A buyer thinks of what he wants, a salesman thinks of what commission he can get from the transaction, based on the buyer’s pocket book. Hmm … guess I created a pretty good motorcycle salesman character last night after all. Disclaimer: the motorcycle salesman created in this dream does not reflect in any way upon any other salesman, real or imagined. It was just a dream. Author jclarke45Posted on December 15, 2014 December 16, 2014 Categories Human Interest, WritingTags characters, creative writing, dreaming, salesmen, science, technical writingLeave a comment on How to Create a Motorcycle Salesman in Five Easy Minutes? Lately I have been puzzled by news reports about fellow scientists who are thinking not just out of the box, but out of the universe. The first news that had me struggling was the suggestion that a universe might be the projection of a hologram. Not our universe, necessarily, but some artificial, mathematically contrived universe. Of course, the news outlets added a more dramatic flare to that headline, which on further reading was wildly misleading. I don’t think any scientist was claiming that we are actually a hologram, a three-dimensional projection of a lower dimensional us. Try to translate for the popular press arcane notions of mathematical physics, and you’re bound to come up with some misrepresentation. We are not, I argue, like the projected holograms of Princess Leia asking Obi-Wan Kenobi for help in the Star Wars epics. However, it certainly would be interesting to think about. Who, we might ask, made the hologram, and who is projecting us and our galaxy into what we perceive to be a three-dimensional universe? Speculation could run wild. Now there is another speculative and down-right mind-assaulting scientific proposition. As the press is representing it, it is proposed that we are “living” in a computer simulation. The actual human race may be long dead and vanished, but some technologically advanced civilization has coded a simulation of the defunct human race. For what purpose, I have no idea. Unless of course we are not just a simulation, but a computer game wrought for educational purposes. But perhaps that’s being too charitable. I would put odds on us being simulated for entertainment purposes. Or, perhaps the base part of the human simulation is not intentionally evil, but the result of bad coding. Coding “glitches” do occur, from the ObamaCare website to computer games, with sometimes unexpected results. Most computer gamers have experienced, or have heard of, bizarre things happening when the gaming software has a glitch. Game characters may unexpectedly launch into outer space, or disembowel themselves, when all they were supposed to do was take a step forward. In spite of what this post title says, I’m not suggesting that the published scientific assertions are in fact true. However, as a species we should at least consider the implications if they were true. What if my love affair with a young woman were simulated, or a projected hologram? The way I felt was so palpable, so vibrant that it’s hard not to believe in its reality, and its uniqueness. What if the birth of our children, and their children, was simply part of a gaming script? What if our lives were simply an immersive simulation? For me that would make life hollow and unsatisfying. However, in my simulated brain I would still have to wonder about the person or persons who created us, the coders of the simulation. They would be, for all practical purposes, our simulation Gods. Now that is ironic. I do not actually believe the hologram or simulation hypotheses, but I do find it interesting that these brand new scientific propositions seem to force us into considering a creator, a God. And to think, mainstream science has been trying to force us away from the belief in God for most of the last century. So, I have to wonder, is science changing its mind? 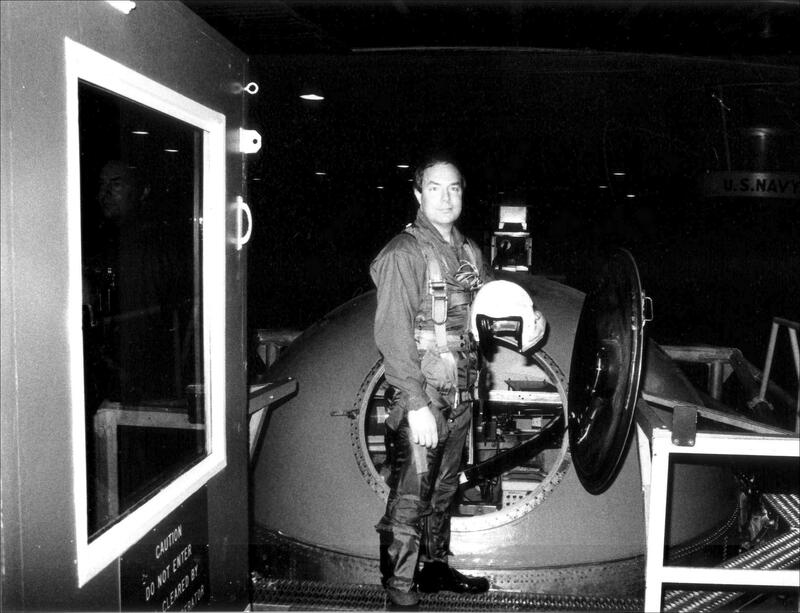 I was securely strapped into one of the world’s largest human centrifuges at the Naval Air Development Center (NADC) Warminster, Pennsylvania, jocked-down like a pilot in a high performance fighter. As the gondola started moving, I felt the pneumatic cushions in my G-suit inflate, squeezing my legs and abdomen, helping to prevent blood from pooling. Excess pooling would cause a decrease in the volume of blood being pumped to my brain, potentially resulting in unconsciousness. That type of blackout is called G-LOC, or G-induced loss of consciousness. G is the term for the acceleration of gravity, about 9.8 m/s2. I was being exposed to a relatively mild but prolonged 3-Gs. To put that acceleration into perspective, the shuttle astronauts are exposed to no more than 3-Gs near the end of their climb to orbit, and briefly during reentry. The Apollo astronauts headed to the moon were limited to a maximum of 4 Gs, again during only a brief period of time. But my three-G exposure was not brief. If I had been launched upwards with a 3-G acceleration for three minutes I would have been travelling at almost 12,000 miles per hour at the end of those 3-minutes, over mach 15, and would have climbed 296 miles, well above the altitude of the International Space Station. It would have been a sight to behold. Another 3 and a half minutes and I would have been going fast enough to escape Earth’s gravity. Alas, in reality I wasn’t going anywhere, except in circles around the inside of the centrifuge room, attached to a 4000 hp electric motor by a 50-foot long arm. During the run I experienced about what I’d expected — I felt heavy, very heavy, like 3 times my body weight heavy. But I was not at all expecting the sensation I got when they put on the brakes. I felt like a bowling ball careening down a bowling lane. I felt like a gymnast doing impossibly fast forward somersaults. And I’m very glad the photographer took a photo before the run, rather than after. I was at Warminster to study the stresses imposed on F/A-18 fighter pilots during high-G exposures. In the 1990s, losses of aircraft and pilots were an all too frequent occurrence during high-speed maneuvering flight due to G-LOC. 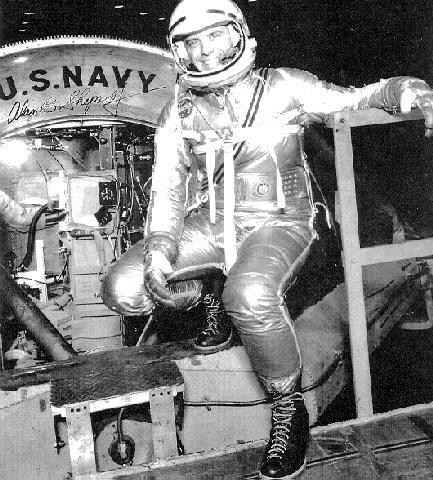 To prevent G-LOC pilots need to perform, with precision, an anti-G straining manuever, even though they wear the same anti-G suit I was wearing. 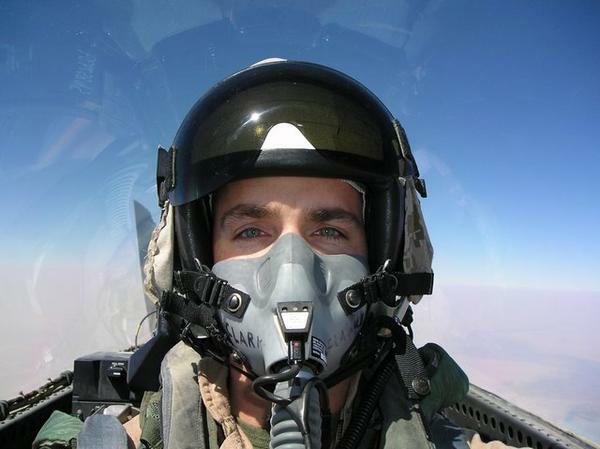 To understand the fighter pilots’ problems, anti G-suits provide at most 1-1.5 G protection advantage. and most people lose consciousness above 3-5 Gs without a G-suit. But a fighter like the F/A-18 can easily pull 8-9 Gs during close in combat. That is where the anti-G straining manuever comes in. The pilots grunt and strain, contracting their leg and abdominal muscles during the high-G portion of the pull, forcing blood from their abdomen into their chest cavity, making blood available for the heart and brain. Compared to the centrifuge ride, a flight to the moon was a cake-walk, except for Apollo 13 of course. The NADC centrifuge was closed by the BRAC committee in 1996. The Navy Aerospace Medical Research Laboratory in Pensacola FL also has a centrifuge in which I’ve ridden, but NAMRL is closing as well, in September 2011. It seems like military man-rated centrifuges aren’t as popular as they used to be. Fortunately, NASA has a modern centrifuge, although its maximum G-force capability is about half that of the NADC centrifuge. 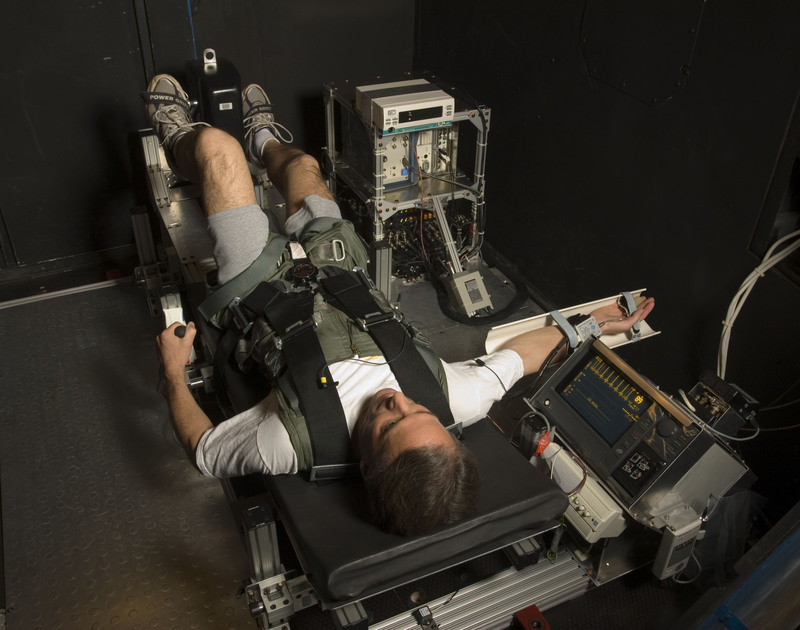 Nevertheless, anyone who has ridden a centrifuge will tell you the 20-G capability of the NASA Ames centrifuge is more than enough to test human endurance to the forces of acceleration.